Artist and jazz musician Matt Glassmeyer is on top of the Nashville, Tennessee music scene. And the Nashville music scene is on top of his house. Or, at least on top of his porch. 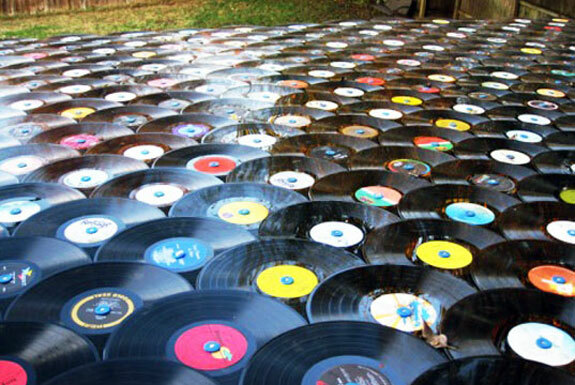 That’s where Glassmeyer constructed a roof using 350 vinyl records. The LPs are arranged in an overlapping pattern like what one would use to lay roofing shingles. Each one is held in place by a nail through the record’s center hole (with a washer atop each nail to keep the record firmly in place). Now, before you decide to tear down your home’s roof and replace it with your old collection of ash-covered Pink Floyd albums, we’d like to remind you of our terms of service which state that Spot Cool Stuff isn’t responsible for any damages that result from how you use the information on this site. We’d also remind you that Glassmeyer constructed his alternative roof over an exterior porch that’s already exposed to the elements (see photo, below). If water starts flooding in through the roof, or the whole thing blows away, no harm done. It isn’t clear how well Glassmeyer’s record-roof will hold up over time; at writing it has remained sturdy for two years and counting. The roof does not get direct sunlight, which would certainly warp vinyl quickly. Nashville does get humid, but it doesn’t get very cold or receive large quantities of rain. Under those conditions, the roof could easily last for another two years or more. In the meantime, it is very cool-looking. Help! 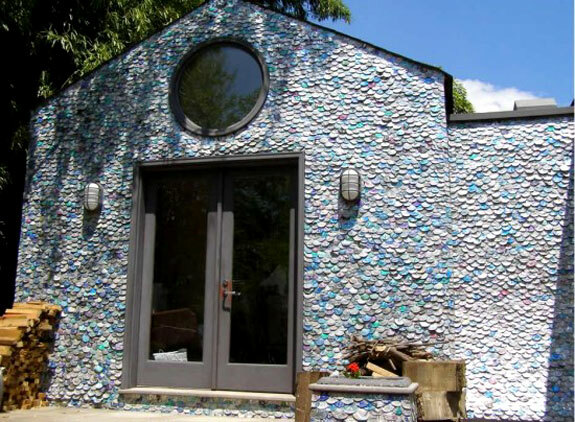 We have an overdose of puns to use in our write-up of the American architect who covered large portions of his house, including his roof, with crushed aluminum cans. 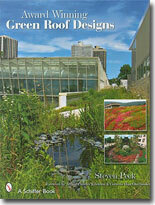 Let’s just say that the architect—Richard Van Os Keuls of Silver Spring, Maryland—has a can-do spirit. When Van Os Keuls hosts parties the drinks are on the house. I’ve heard of aluminum siding but this is ridiculous. Unlike the roof made with vinyl records (above), Van Os Keuls’ upcycled roofing material is more for decoration than functional. Though the cans provide some insulation and protection, it is the unusual, slightly-shimming look they create that’s the key benefit. 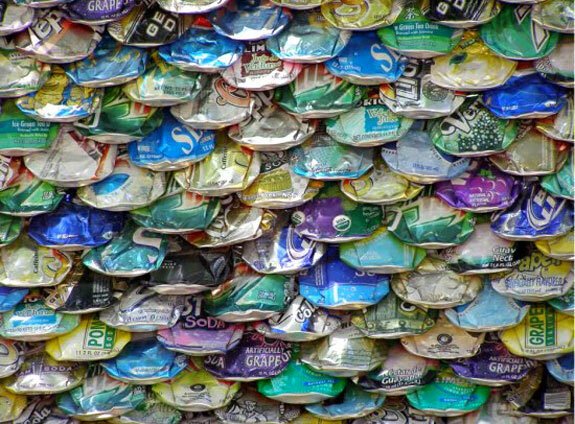 To use cans as a housing material it helps if you are patient. And meticulous. And a lush. Covering 10 square feet (nearly 1 square meter) requires between 350 and 400 cans. Each can has to be inspected, thoughtfully washed (so as not to attracting bugs) and confirmed as being comprised of 100% rustproof aluminum. That done, the cans must be crushed just-so to create a round shape and avoid sharp corners. Van Os Keuls himself crushed every can that’s on the house pictured below. So, in this post, you could say we spotted Keuls stuff. The world is overflowing with used car and truck tires. Disposing of them properly (as opposed to dumping them in a back yard) is expensive and/or environmentally harmful. Which is why Spot Cool Stuff loves products made from upcycled tires. Previously we featured the cool Indosole sandals. And now this: Euroshield roofing. 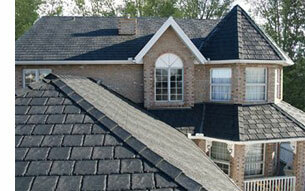 Euroshield’s roofing is 75% comprised of reclaimed tire rubber. And additional 10% is comprised of other recycled material. (We’re guessing that the remaining 15% is plutonium). Covering a typical house with the company’s roofing reuses between 600 and 1,000 old car and truck tires! 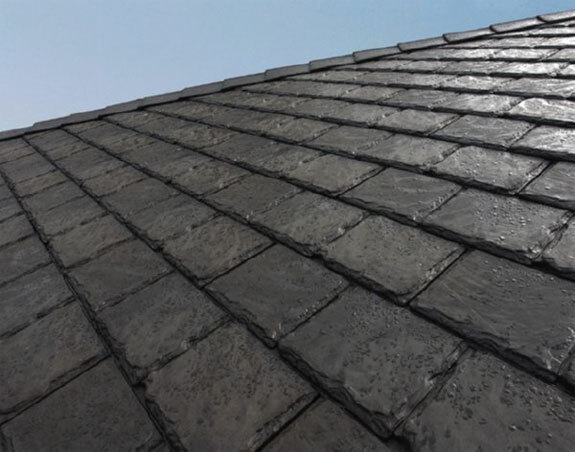 There are three types of Euroshield roofing material to choose from: EuroSlate, EuroTile and EuroShake. (The gratuitous use of the prefix “Euro” is an odd marketing choice given that the manufacturing company is Canadian and their product is not sold in Europe). Each Euro roofing type is designed to look like a “normal” roof. They are also extremely durable—arguably more durable than conventional shingles. 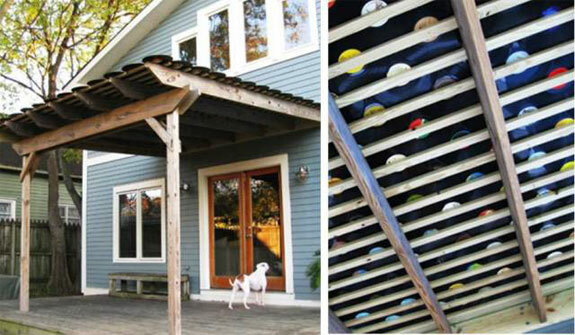 So covering a house with material made from old tires is not only environmentally friendly, it’s practical as well. Those records are my favorite! Very cool. I think car tires is one of the durable kind of roofing.We know that it is made of rubber and it is very durable..great post! 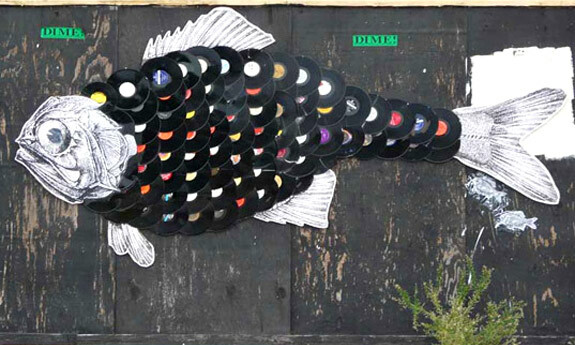 I am both happy to see vinyl records being re-used for eco-friendly purposes, but also sad to know they will be utterly destroyed by the elements. An outdated medium indeed!